WILLEMSTAD - On March 17, 1949, exactly 65 years ago, women in Curaçao, for the first time, received voting rights. Through the introduction of universal suffrage, it became possible for men and women over 25 years to vote. This particular day was celebrated this morning, including an honor to the first woman in Parliament: Altagracia de Lannoy-Willems (1913-1983). 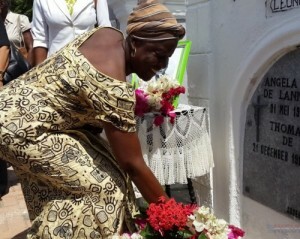 Former Prime Minister of the Netherlands Antilles, Maria Liberia-Peters gave a speech in which she indicated what the importance is of the right to vote on the island.